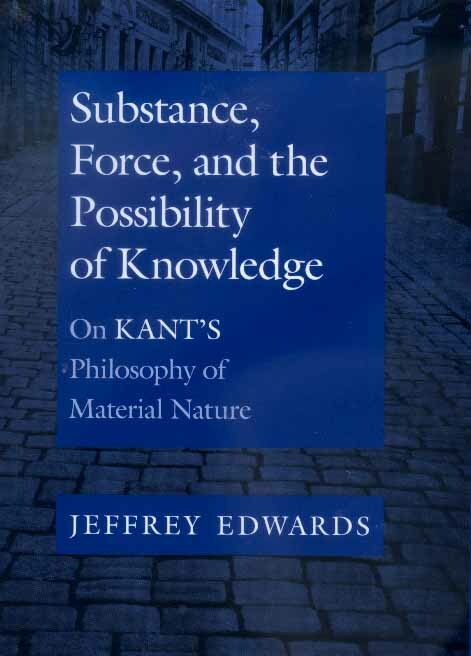 A new understanding of Kant’s theory of a priori knowledge and his natural philosophy emerges from Jeffrey Edwards’s mature and penetrating study. In the Third Analogy of Experience, Kant argues for the existence of a dynamical plenum in space. This argument against empty space demonstrates that the dynamical plenum furnishes an a priori necessary condition for our experience and knowledge of an objective world. Such an a priori existence proof, however, transgresses the limits Kant otherwise places on transcendental arguments in the Critique of Pure Reason because it establishes a material transcendental condition of possible experience. 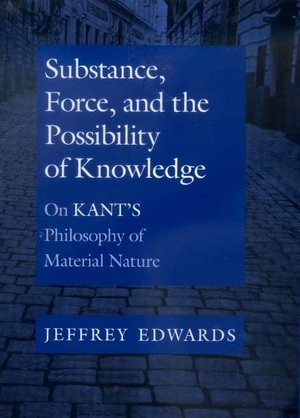 This finding motivates Edwards to examine the broader context of Kant’s views about matter, substance, causal influence, and physical aether in connection with the developmental history of his theory of transcendental idealism. Against the backdrop of early modern metaphysics and contemporaneous physical theory, Edwards explicates the origins of the Third Analogy in Kant’s early work on the metaphysics of nature. The argument against empty space presented in the Third Analogy reveals a central aspect of Kant’s transcendental theory of experience that Edwards explains lucidly. By clarifying the epistemological standpoint at issue in the Third Analogy, he shows that the fundamental revisions to which Kant subjects his theory of knowledge in the Opus postumum not only originate in his precritical metaphysics of nature but are developments of an argument central to the Critique of Pure Reason itself. Edwards’s work is important to scholars working in the history of philosophy and the history and philosophy of science, as well as to Kant specialists. Jeffrey Edwards is Assistant Professor of Philosophy at the State University of New York at Stony Brook.